Enjoy knitting for the girls in your life with this selection of perfect patterns! From cardigans to bracelets, there is something that everyone will love! These bobble colour block jumpers come in two different bright colour ways. Why not knit up both! These adorable crochet bracelets would make great friendship bracelets. Any little one would love to give them to their friends, make in a range of bright colours. Suitable for an intermediate crocheter! This gorgeous pom pom and cable hat will keep heads warm and cosy! Knitted in a soft merino blend dk yarn, this hat can be made to fit ages four to twelve year olds. The pom poms add an extra cute touch. This unusual pattern is knitted with a chevron pattern around the bottom edge. Made in a cotton and acrylic blend, this skirt will last a long time and is suitable for all occasions. This lovely cardigan is knitted in pastel colours. A simply gorgeous and classic design, it will go down a treat! Knit up this adorable bag, any little girl would love it! Made in a cotton yarn, with 3D flower motifs attached. The perfect size for a few small items. Knitted in a soft cotton yarn, this design is beautiful and simple. The small flowers are knitted in using the Intarsia technique. 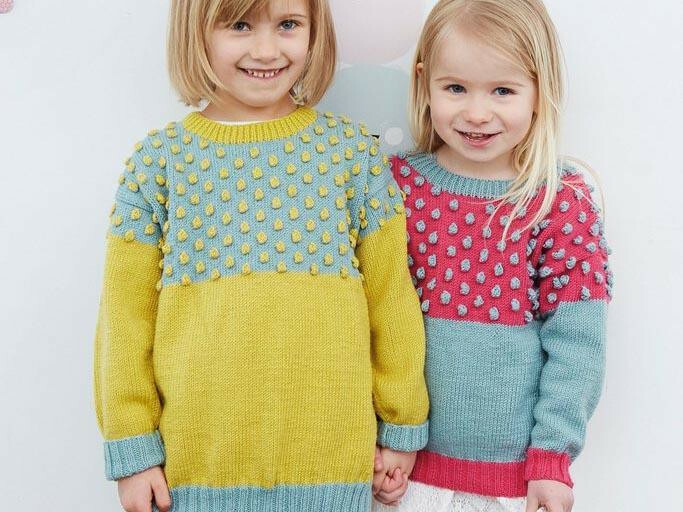 This lovely jumper will keep little ones cosy! Who wouldn't love their own mermaid blanket? These are lots of fun and great for cosying up on the sofa. Crochet up in an Aran weight yarn. Combine knitting and crochet with this white and navy striped dress. The crochet edging and bow details add extra cuteness! Make a matching bag with the left over yarn. ﻿This pink sequin top is perfect for a party! What little girl wouldn't love to dress up with a matching pink skirt. Can be made to fit four to twelve year olds. For plenty more knitting inspiration and ideas, see the whole range of Woman's Weekly patterns on The Knitting Network website.